Last month, following the abrupt closure of Thundering Hooves — the Walla Walla company known for its sustainably raised meats and poultry — I asked the question: “Where’s the grass-fed beef?” Chefs, restaurateurs, ranchers and readers were quick to provide a response. This week, Keith Swanson, former sales and marketing manager for Thundering Hooves, got on the wagon and provided me with another answer: Walla Walla’s Blue Valley Meats, whose initial inventory includes (wait for it) Thundering Hooves meat, much of it discounted for quick-sale in what he’s referring to as “phase one” of the start-up. 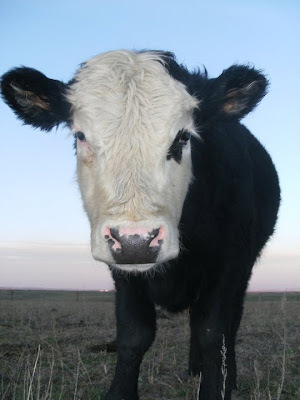 Moooo-ve over, and say hello to this grass-fed calf, say the gang at Blue Valley Meats. Swanson and his new business partners met at Thundering Hooves, a fourth-generation family farm whose family members include his wife, Clarice. After parting ways with his in-laws in January, followed by the shuttering of their company, Swanson — who lives with his wife and children on their own 10-acre family farm — recognized that he and Clarice loved the business, the lifestyle and the connections they made with customers throughout Washington and Oregon, and wanted to jump back in as soon as possible, he said. To that end, they’ve formed a far smaller operation that will focus on direct-sales. His partners in the new venture include Geoff Forcum (who ran Thundering Hooves’ ranch- and processing operations) and Christopher Galasso (the defunct company’s head butcher) as well as Christopher’s wife, Kimi. The Huesbys, the majority owners of Thundering Hooves, are not connected with Blue Valley Meats. Thundering Hooves filed for chapter 7 bankruptcy late last month. Those pick-up sites include Seattle-area parking lots (among them Ray’s in Ballard and Eat Local stores on Queen Anne and in Burien) as well as host-sites at private homes. Having provided this service in the past, and intending to focus on it in the future, Swanson believes, is better for his small company and for the consumer. “Instead of sitting at a farmers market for seven hours waiting for a customer to come to us, this model allows us to visit 10 different neighborhoods a day, dramatically increasing the reach of our products, and the convenience for customers who just have to drive within their own neighborhoods rather than travel 5 or 10 miles away” for pick-up. Phase two for Blue Valley involves launching a new line of freshly produced grass-fed meats, dairy from grass-fed cows “and a few additional product-lines beyond what Thundering Hooves used to do,” including the distribution of wild-caught seafood, Swanson said. “We’ll be sourcing high-quality local livestock, primarily in Walla Walla — though the guy who raises poultry for us is two hours away.” In addition, Blue Valley is remodeling a former mercantile in its hometown, slated to open in May as a USDA-inspected old-fashioned butcher shop. Operating on fewer acres of land, sourcing meats from a “very select group of producers” yet continuing the Thundering Hooves tradition of processing beef on-site, is paramount to the company’s success, Swanson said.